Things I like about Sydney No. 4: browsing the INSECT KILLER! aisles in supermarkets. 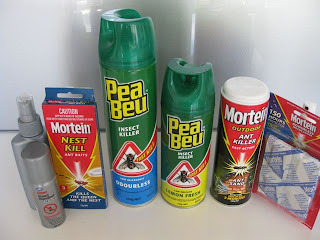 As you can see from the above photograph of products I have bought (I don't just browse, folks), the INSECT KILLER! displays in supermarkets are very colourful. Everything is characterised by great swathes of primary colours with ZAP and POW arrows and LIGHTNING flashes and I'm totally, totally convinced by the efficacy of it all. Products are made by companies with completely bizarre names: Mortein (perhaps supposed to make us think of morticians and therefore death: TOTALLY convinced) and Pea-Beu (so unfathomable and I have no idea how to pronounce the name but again TOTALLY convinced) are the most prolific but there are many, many others. For the most extraordinary thing of all about INSECT KILLER! sections in supermarkets is how ENOOOOORMOUS they are and just how many products you can buy - with the obvious corollary being just how many bloody insects there are in this country...Imagine how many people are waging war daily against them. If we all stopped spraying and blasting and ZAPPING and POWING for a week I reckon the world would collapse under the weight of all those liberated beasties. Daniel came back from Franklins (our local and very low-rent supermarket which nevertheless has shelf after shelf after shelf of INSECT KILLER! products) bearing Mortein's NEST KILL the other day which gave me my biggest frisson of excitement in weeks. Here was a product that doesn't just kill ants (as you can see, we already have that). NO! This product kills ANT NESTS!!!! There's a lovely description of exactly how this is achieved on the back of the packet. It uses the word KILL a lot as well as random CAPITALS (which you may notice I am doing in honour today of INSECT KILLER! produce). Unfortunately, I'm still confused by and stuck on Step No. 1: Eliminate alternative food sources....Does this mean I have to throw away all the food in the house? Do ants eat everything? HELP! ZAP! POW! For those of you wondering why all these products are needed I thought I might give you (without moaning or complaining or anything) an example or two of things that have casually appeared in our house. This was living in the kitchen for a while. In itself this is bad enough. The spiders I'm used to aren't a) hairy and b) huge or c) possibly poisonous. 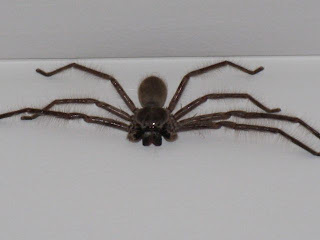 What worried me particularly about him however was the fact that with a spider this big something has to have been even bigger to have gnawed off its missing eighth leg. The even bigger thing was, knowing spiders and their appetites, probably its mate. Therefore, I concluded, somewhere nearby is AN EVEN BIGGER BLOODY SPIDER. Also rather alarming was the fact that before it was living near the ceiling in a nicely visible fashion Daniel discovered it by overturning a chair. Now that is lurking with intent. All Australians will say about these Huntsmen spiders is that "Oh, they're really good to have around. They eat other insects." Well, why didn't it eat this then? 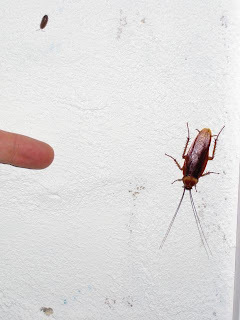 As we all know, cockroaches (of which this is one) are wholly repugnant. If the Huntsman was any good it would have chomped on this for dinner instead of which the two lived side by side apparently having a bit of a tea party. Apparently Australian aborigines use cockroaches to obtain a local anaesthetic so I must remember to head for the garage when I've run out of Savlon. Except for the fact that the garage is now out-of-bounds. The other night I discovered a true, genuine, horror there...a redback spider. These can kill. I'm heading off to Franklins again now to see what's there to ZAP the thing in the INSECT KILLER! aisle. The excitement! HA! I can add to my collection of sprays. Pea Beu sounds a bit too cute for an INSECT KILLING substance - like "peep bo". Unless of course, the idea is that you play "peep bo" with the insects before ZAPPING them. No. PEA BEU: beautiful pea, nice small thing detected by princesses, detecting small things TO KILL. Simple really. Any chance of a pic of the red back please before extermination? (Though I don't expect you to hold your finger in the frame for reference!) And how did you discover it? (they're small aren't they? )did you recognise it? did you screech?